For this Fourth of July weekend, I bring you a pie, but not any pie — a Frito pie, which actually isn’t a pie at all. Fritos are smothered in chili and topped with shredded cheese, authentically served straight from the Frito bag. I thought why not make this American classic even more American and serve it over grilled hot dogs!!! I’m pretty proud– it’s officially the best idea I’ve ever had. I tried out this monstrosity over Memorial Day weekend and trust me, there is no other way to eat a hot dog. Happy Fourth of July everyone! Hope it’s filled with lots of fireworks, beer and Frito pie hot dogs! Grill the hot dogs for a few minutes on each side over medium heat so the outside has light grill marks. 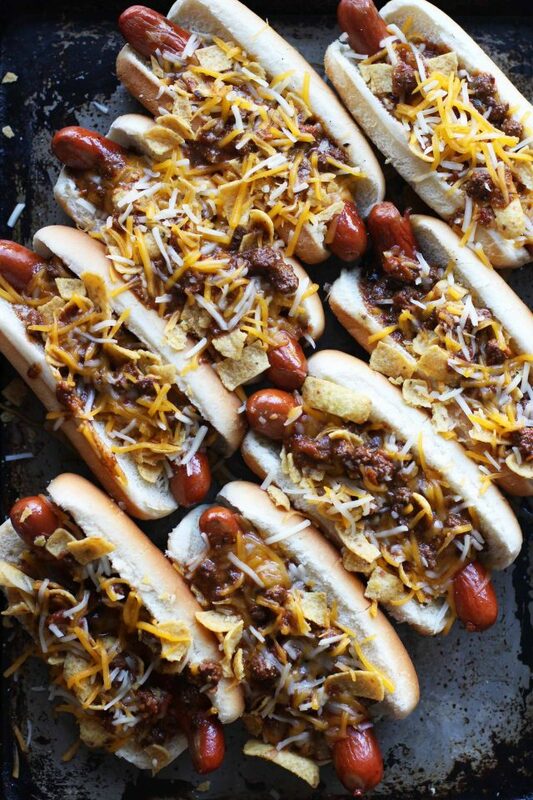 Top each bun with a hot dog, top with 1/2 a ladle of chili, add a handful of lightly crushed Fritos, top with another 1/2 ladle of chili, top with more lightly crushed Fritos and then top with cheese. This idea has been around for at least 15 years. I works at a place in the mall in 99 that sold these. I used to eat them on my lunch break.